The Social Partnership advocated for employers and trade unions can be likened to a pack of hungry wolves inviting a flock of ducks to sit at the dinner table. 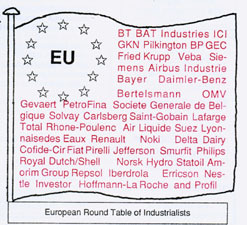 An examination of who is behind this apparently benign relationship reveals the little known European Round Table of Industrialists formed in 1983 with the help of European Commissioners. 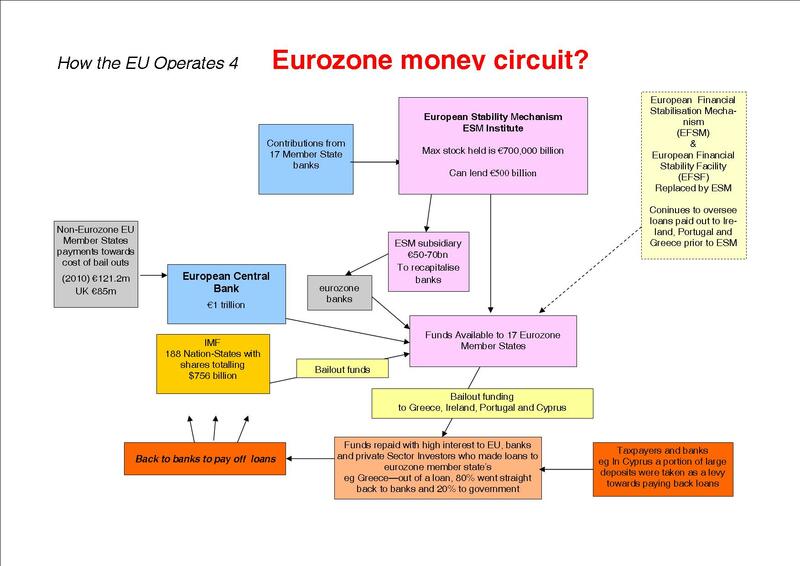 The ERT consists of the largest 46 transnational corporations in the European Community. They include Shell, BP, GEC and BT. 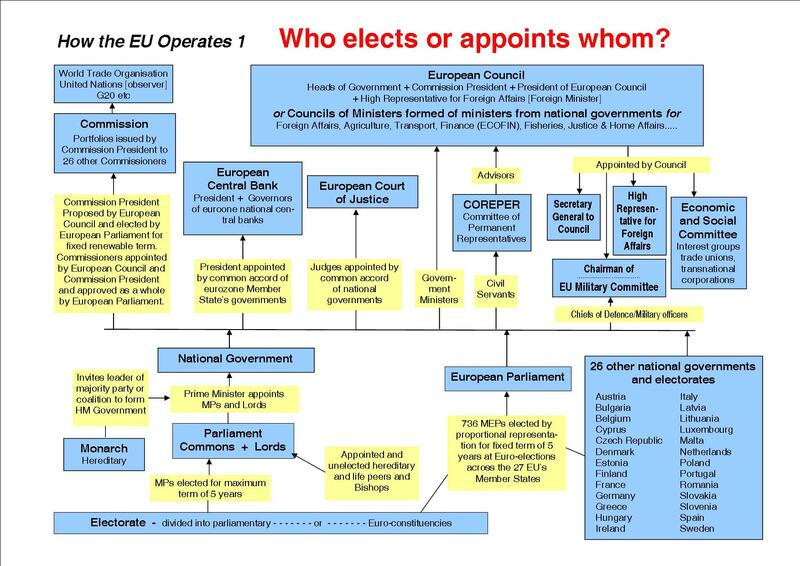 RT influence over the EC led to their reports being used to set up the Internal Market and the Single European Act which consolidated the thrust to European Union with a single currency specified in the Treaty on European Union (Maastricht). The ERT pressed for, and won, an expansion of the Euro-infrastructure including the Channel Tunnel and Trans-European Networks (TENS) with hundreds of miles of new roads and motorways. A Competitiveness Advisory Group was set up by Commission President Santer in 1995. In 1997 he appointed three representatives of ERT corporations, three other corporate interests and three trade unionists to the CAG. Representatives from the ETUC were now part and parcel of a "Europe" run for corporate interests. This is part of the social partnership in practice where decisions taken at the EU level are passed back down a conduit to national TUCs and trade unions. The effect is to draw trade unions and those who work into a corporate state run by Brussels. The ERT demanded "employee flexibility" in the labour market and removal of legislation which protected workers. The ERT in 1993 stated "labour costs are the single major cause of falling competitiveness" where wages and corporate taxes must be cut and productivity raised. These objectives of more "flexibility" and "competitiveness" are mouthed repeatedly by Euro-politicians and Government ministers to workers in the name of jobs. The ERT introduced "benchmarks" which takes lowest costs, and wages, across the world as standard practice. All this is the hidden background which makes clear why anti-trade union laws have not been repealed by the current Labour Government. European Works Councils have no powers to negotiate and play no role in decisions of the relevant corporation and are to gag trade unions. * Demand the Government run Britain on behalf of people instead of transnational corporations, profits and competetiveness.